Engineering Experimentalism: Upcoming KPSU Gigs – ACRONYM Inc. Even more fun is on the horizon this spring as I begin rapidly filling up all the dates on my calendar. Here are a pair of audio offerings that you may be interested in, that you can hear via the comfort of the radio on your Inter-Web-A-Tron at kpsu.org. First on the agenda is an appearance by none other than Crank Sturgeon on What’s This Called?, hosted by Ricardo Wang. I’ve been engineering live performances on Ricardo’s show since it transitioned to KPSU in 2005, and Crank has made a number of amazing appearances on the show since then. As Crank and I will be on a mini-tour together, our last stop will be in the KPSU studios, where he will be kicking out the jams one more time before he gets back on the road. 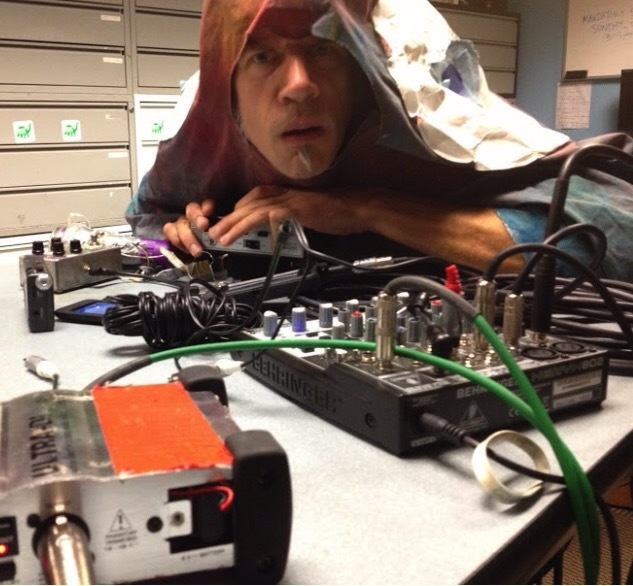 If you are new to Crank’s music, it can best be described as a pulsing electro-organic performance with home-made gear, costumes, dancing, and a vision that is unique even among his peers. Tune in to kpsu.org on March 28th at 12 Noon to hear him rock the KPSU studios, and you will find out what I’m talking about. Next on the agenda is KPSU’s 24 Hour Live Broadcast on April 11th. Last year, KPSU brought listeners a full day of live treats and goodies, and they have decided to repeat the feat this year, culminating in a series of experimental performances leading into What’s This Called? on the morning of the 11th. Ricardo Wang was kind enough to ask me to be a part of this show, and I’m very excited to find out what he has in store for listeners. While none of the acts have been selected yet, a quick glance at his broadcast history will give you an idea of the kinds of acts he usually gets on his show, and this should be the kind of event you will not want to miss. Set your alarm for experimental fun Saturday morning, and you will be rewarded with a number of incredible performances by some excellent acts. As usual, the year has only just begun, so there will be more updates and information as we have the details. Music is good for the soul, and I love filling you in on all the soul-enriching information I have at my disposal.